Historian and Collector, Member San Rafael FD Fire Commission. Stephen Mizroch was born and raised in Norfolk, Virginia. From a young age he wanted to be a Geriatrician, and later completed his undergraduate education at Emory University in Atlanta, Georgia. From there he completed medical schooling at the University of Pennsylvania. His internship and residency was completed at Kaiser Permanente in San Francisco, when then led to a 31-year career at Kaiser, San Rafael, practicing internal medicine and geriatrics. When asked what attracted him to Geriatrics, he responded "I have always had a 'mature brain'....as opposed to an 'adolescent brain'.....or rather 'mind set'. I saw that wisdom could emanate from experience and I always had a curiosity about 'life experiences'...my own and the experiences of other people...I believe that is what drew me towards Geriatrics. Practicing Medicine is an honor...and it was a satisfying career for me...both emotionally and intellectually." Now retired, he is married to Mary Mizroch, and they have one grandchild. He started collecting fire department memorabilia such as badges, patches, speaking trumpets, documents, and photographs after obtaining his first antique badge from Roger Tobin of San Rafael Rare Coins. "My first badge was a San Francisco Exempt Fireman's badge from the 1800's," he said. Dr. Mizroch joined the San Rafael Fire Commission as an 'alternate' member in 1992, and was appointed shortly thereafter to a regular member position. He has served continuously on the Fire Commission since then for over 23 years. He is also now a contributing member of the Marin County Fire History Committee. Look for images on fire patches on the various department pages, those are typically from Steve. "This is cool. I met Dr. Stephen Mizroch at a fire weather meeting and afterwards, he asked me for a Tam Crew patch. I told him we didn't have a patch but just a logo silk screened on our tee-shirts. He asked if he could get a copy of the artwork. Two months later, he delivered a stack of Tam Crew patches that he paid for. I am glad you added a piece on his collection as you do not see random acts of kindness like that!" When I tell people that I collect Fire Department patches, they usually ask two questions. First, “Why?” and Secondly, “How many patches do you have?” Neither question is easily answered. I have served on the San Rafael Fire Commission for more than 20 years. Fire protection, paramedic service and disaster preparedness are key goals for the Fire Department and the Fire Commission strives to support those efforts. One ancillary area that has captured my attention is the insignia (i.e. patch) that most Fire Departments use to represent themselves. Throughout the state of California (and the world), Fire Departments, large and small, design unique patches to represent their members and their organization. Patch design may be simple or complex. Size varies; shape varies; color varies. Patches often reflect a local landmark or institution of prominence in the jurisdiction of the department. Or they may convey “just the facts”. The patch may represent a city, town, county, a state-wide organization or even a single engine crew, task force or Hot Shot crew. The patch often tells a story and, over time, the design may change significantly. 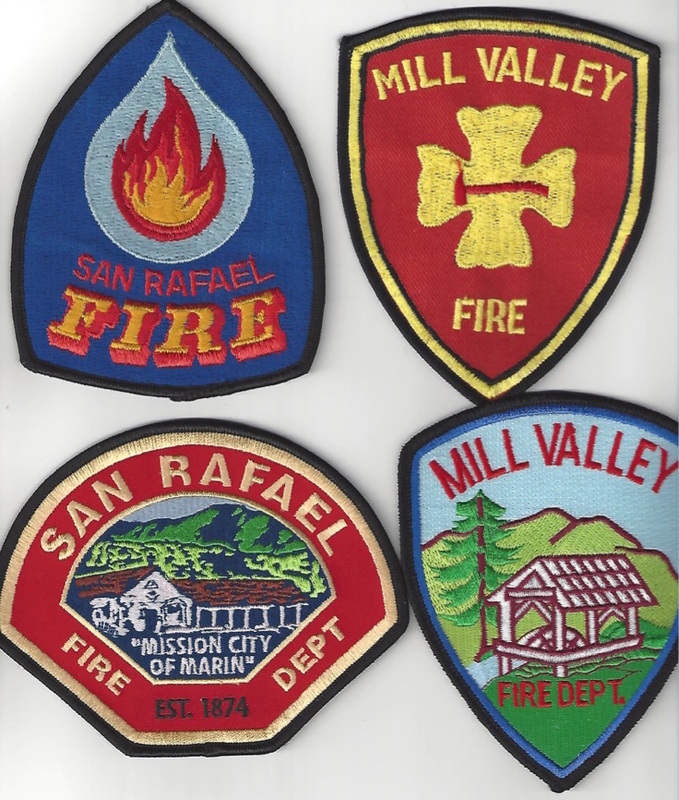 For example, considering two departments in Marin County, San Rafael & Mill Valley: Early patch designs of these departments were simple, naming the city, but without other identifying information. More recent designs reflect city heritage and landmark images, the Mission for San Rafael and the Old Mill for Mill Valley. See images below. Personally, the hobby of collecting California Fire patches has sparked in me an appreciation for the state, its history and its geography in a way that has been exceedingly enjoyable. While collecting Fire patches is both visually and intellectually satisfying, an added perk is that there are many other California Fire patch collectors both in California and outside the state who provide a peer group, support system and trading network that enhances the hobby and expands collecting opportunities. A patch is ephemeral. Sometimes taken for granted and discarded with a well-used shirt or jacket, many older patches survive in exceedingly low numbers. Some designs have probably been lost forever. As a patch collector, I feel I am a caretaker of history, preserving the Fire crew patch is both an honor and a duty to history. Note from retired San Rafael Chief Bob Marcucci: "Why San Rafael FD has a patch - There was a major parade in San Rafael in 1974, and we placed firefighters on golf carts along the parade route. The Firefighters came back and said no one knew who they were and we needed a patch. We had a patch design contest for firefighters and Ralph Chubb, a creative Firefighter Engineer, came up with a patch design that the staff selected." The patch was later changed to the current version under Chief Bruce Martin, now retired from Fremont FD. See Slide show below - Local memorabilia in the Dr. Stephen Mizroch collection, including patches, Larkspur FD badges, ID Cards, A ticket to a Mill Valley Fireman's Ball from 1939, and a safe driving certificate from 1962.